Michael Meissner has family roots in eastern Montana that reach as far back as 1840, and was raised in both eastern and western Montana. His great-great grandfathers Adam Rasley and Charles Crockett are both buried atop a lonely hillside in Bloomfield, Montana, a nearly forgotten homestead community on the plains of eastern Montana. Many other of his ancestors found their homes in Glendive, Miles City, Circle, Richey and Forsyth, Montana. Michael studied at the University of Montana in Missoula and has worked in pencil, pen and ink, watercolor, oils and acrylics in various styles over the years. 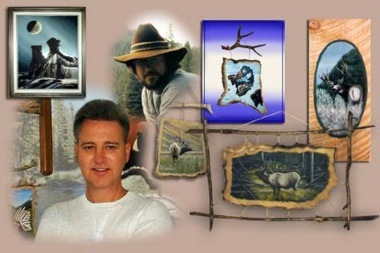 His work has featured surrealistic themes, as well as landscapes, wildlife scenes, and mixed media articles. He has more recently settled into developing scenic western, native American and wildlife art themes using acrylics on canvas, antique articles and tanned animal hides, such as rabbit, deer, elk, moose, caribou and buffalo. His work has been displayed for sale across Montana and in western North Dakota, and can be found in private collections throughout the western states. Michael is an active member of Dawson County Arts Unlimited (DCAU) located in Glendive, Montana. Mountain Cedar Showroom and Gallery, Anaconda, MT. Bison Gift Shop and Gallery, Ravalli, MT.